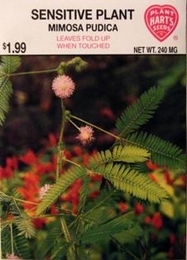 Sensitive plants are one of the most unusual plants grown. It is grown both indoors and out because of its ability to fold up its leaves when touched. Recovery is prompt and can be repeated many times without harm. Plants move less vigorously as they get older. Cut back to a height of about two inches and fresh new vigorous growth will follow. Planting time - Early spring or indoors anytime of the year.